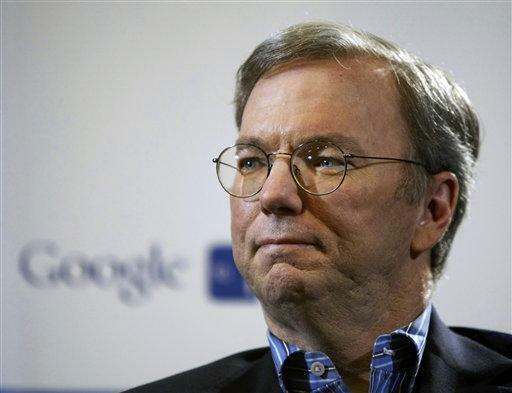 LAKE TAHOE, Calif.--For those concerned with privacy, Google CEO Eric Schmidt gave them a few more things to start worrying about. At a conference here Wednesday, Schmidt noted that using artificial intelligence, computers can take 14 pictures of anyone on the Internet and stand a good chance of identifying that person. Similarly, the data collected by location-based services can be used not only to show where someone is at, but to also predict with a lot of accuracy where they might be headed next. "Pretty interesting," Schmidt said. "Good idea, Bad idea?...The technology of course is neutral but society is not fundamentally ready." His comments came at the start of Techonomy, a new conference devoted to looking at how technology is changing and can change society. Schmidt said that society really isn't prepared for all of the changes being thrust upon it. "I think it's time for people to get ready for it." Schmidt said these records are a challenge for everyone, himself included, as he noted he was a child of the 1960s. "Raise your hand if you were a well-behaved teenager," Schmidt said, drawing few if any hands from the high-powered crowd. Techonomy, which runs through Friday, is the brainchild of ex-Fortune staffers Brent Schlender, David Kirkpatrick, and Peter Petre. Other speakers include Microsoft Chairman Bill Gates and Sun co-founder Bill Joy. Schlender said that the conference organizers remain fundamentally optimistic, a point echoed by Petre. "We invent our way out of problems, even the problems we create," Petre said. "This is the truth we need to show to our children and their children." Schmidt said he sees a balance eventually coming with society and governments coming to terms on how to regulate the collection of information. The end result, he said, will be that computers will be able to do what they are good at--store and recall information, while humans focus on intuition and problem solving. "That separation of power is a reasonable one," he said. On balance, Schmidt said that technology is good, but he said that the only way to manage the challenges is "much greater transparency and no anonymity." Schmidt said that in an era of asymmetric threats, "true anonymity is too dangerous."